I think many of us have been at a point in our lives where we feel useless and unloved, and that's okay. What is more important is that we learn to pick ourselves up again and trumph over our inner demons -- the monkeys in our heads who point at us and tell us that we can't. Pirouette has monkeys in her head that keeps mocking her. Monkeys in My Head is a storybook app in which a sweet girl named Pirouette tries to defeat the monkeys that live inside her head. These monkeys are nothing like the ones you see at the zoo -- they are big, ugly and mean. And they are always saying cruel things to Pirouette, like how she couldn't do anything and that she would never be popular. Tired of being bullied, Pirouette decides to lure the monkeys in a glass cage and trap them there forever. With the monkeys locked up and fighting among themselves, Pirouette no longer feel pressured. Her mind clears up and she is finally able to understand herself again. In the end, because Pirouette has grown stronger, the monkeys no longer frighten her. She takes pity on them, sets them free, and even befriends them. The monkeys in Pirouette's head tries to lower her self-esteem. 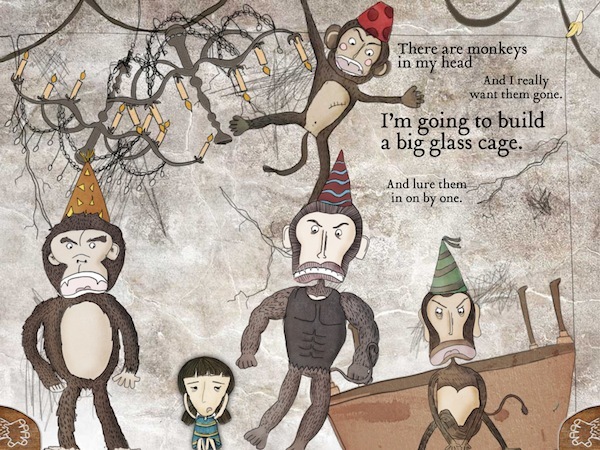 Monkeys in My Head is an interactive storybook app which deals with the topic of inner bullying, self acceptance and coming-of-age. The heroine of the story, Pirouette, struggles with the ugly thoughts (monkeys) that plague her but is finally able to defeat them. Like in most storybook apps, the scenes in each page have interactive elements that can be tapped or tilted with the device. Moving between pages is done by tapping on the previous or next buttons at the bottom of the screen. There are two reading modes, Read to Me or Read Myself. In Read to Me, a young girl's voice lively narrates the story. Parents should know that Monkeys in My Head tells a mature story that better fits older juniors. The dark and gloomy illustrations, while still childlike in nature, may turn off younger juniors. Be wary of the big and angry-looking monkeys, as they may frighten some children. I would highly recommend accompanying your juniors as they use the app, as it can create an opportunity to discuss about self esteem, why we can sometimes feel bad about ourselves and how to overcome those feelings. The developers mentioned that their target age is four and above, but I would say the app is more appropriate for juniors aged eight and above. Pirouette is tired of getting bullied by the monkeys in her head. We review many storybooks here on Geeks With Juniors, but very rarely do we get to see ones specifically designed for slightly more mature readers. Thus, Monkeys in My Head was really refreshing to read. Dealing with a mature theme is not always an easy thing to do, but the app manages to whip up a story that is eccentric, humorous and also scarily deep. The monkeys that plague Pirouette's head precisely reflects the negative thoughts we sometimes burden ourselves with -- I am not good enough, I can't do anything, it's all my fault, they'll never like me. I wonder why Pirouette puts them in a glass cage; is it because by looking at ourselves from a completely different perspective, we can finally understand that those nagging, rotting feelings are really nothing to worry about? Whatever the reason, it has got me thinking since the moment I finished reading. And I like stories that leave me thinking long after I put it down. Visual-wise, the story is beautifully illustrated, even if it is a little creepy (in a good way). It reminds me of The Addams Family, and the girl is sort of like Wednesday. I really like how the colors turn from dark and gloomy into bright and happy when Pirouette finally frees herself from her thoughts. The music is great and perfectly captures the theme of the story. I also think that the narration was well done. Overall, this was an app that I thoroughly enjoyed. Pirouette tries to trap the monkeys in a glass cage, one at a time.